Dermalinfusion is a revolutionary new skin-resurfacing treatment that combines exfoliation, extraction, and serum infusion into a single treatment. The result is improved skin health, clarity, smoothness and appearance. This patented, non-invasive treatment is fully customizable for a wide variety of skin concerns – and is suitable for virtually every skin type, color and tone. Whether you are fighting the visible signs of aging, acne, hyperpigmentation, or even cellulite, Dermalinfusion adds a new and highly effective treatment to your skincare arsenal. The cornerstone of Dermalinfusion’s effectiveness lies in its variety of specifically formulated, medical strength Pro-Infusion serums. Each serum is uniquely designed to address a different specific skin condition or problem. 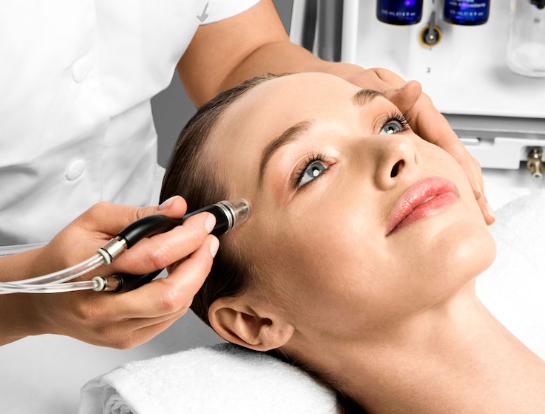 Dermalinfusion’s distinctive simultaneous exfoliation and infusion technology offers unparalleled plumpness, volume, hydration, clarity, tone, and texture – all in a single treatment. The Dermalinfusion exclusive simultaneous infusion technology eliminates time gaps between exfoliation and serum application. By infusing the skin with specially formulated medical strength serums at the exact moment of exfoliation, the skin experiences maximum penetration. As a result, the active ingredients in the formula are able to be absorbed at optimal skin depths. This enhances absorption, receptivity and retention at a deeper level than serum application alone.